wash lighting, path lighting, up lighting, moon lighting, architectural lighting and some silhouetting. It was a pleasure to complete this project. 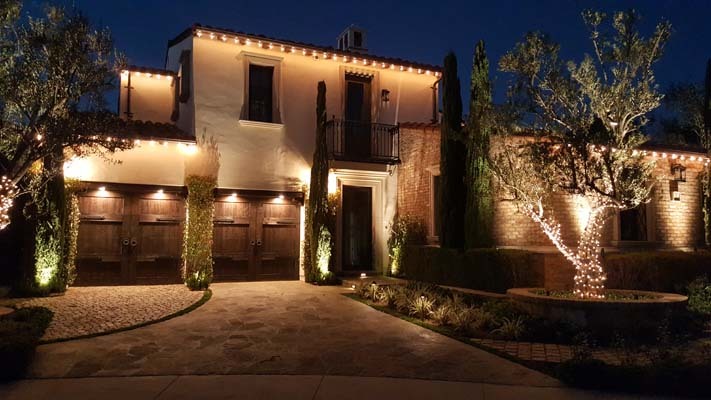 We completed this project in Yorba Linda using Architectural lighting, up lighting, wash lighting and path lighting. 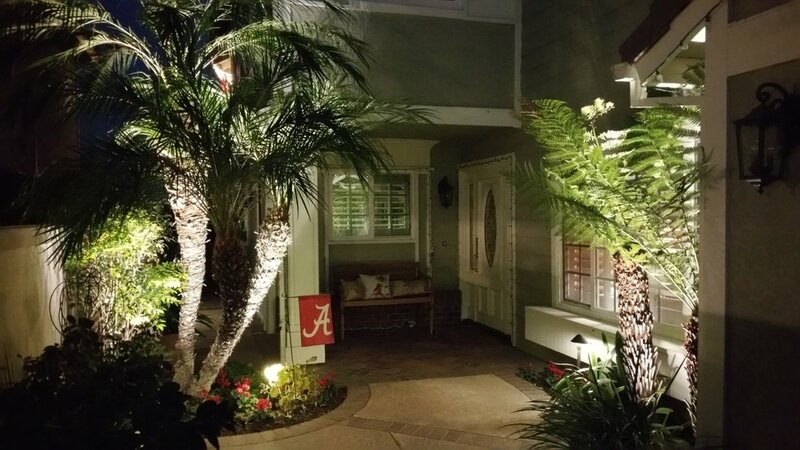 This Newport Beach Home was Designed and Installed by Orange County Night Lights Inc. 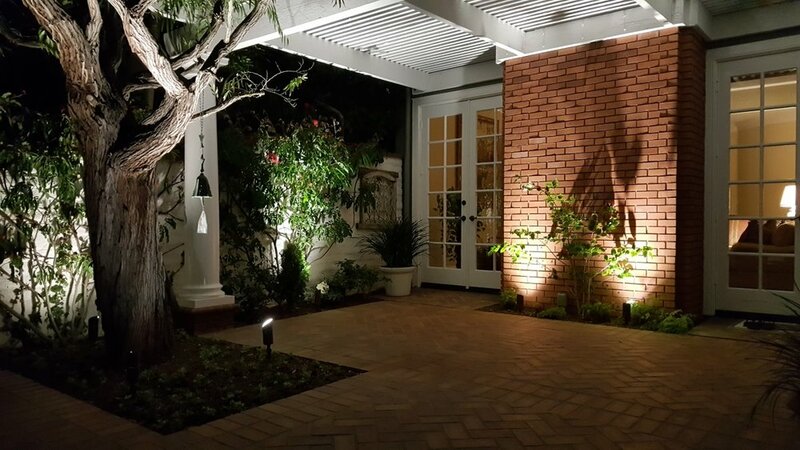 This Project consisted of Professional Cast Brass LED Landscape Lighting Fixtures, accompanied by commercial Professional LED Lamps. Shown in this gallery, you will see the following lighting techniques. Designed and Installed By Orange County Night Lights Inc. All rights reserved. Here are the photos of a project in Anaheim Hills. During this design, our client wanted to achieve a subtle, yet inviting outdoor environment without taking anything away from the amazing view. Design and installation completed by Orange County Night Lights Inc. 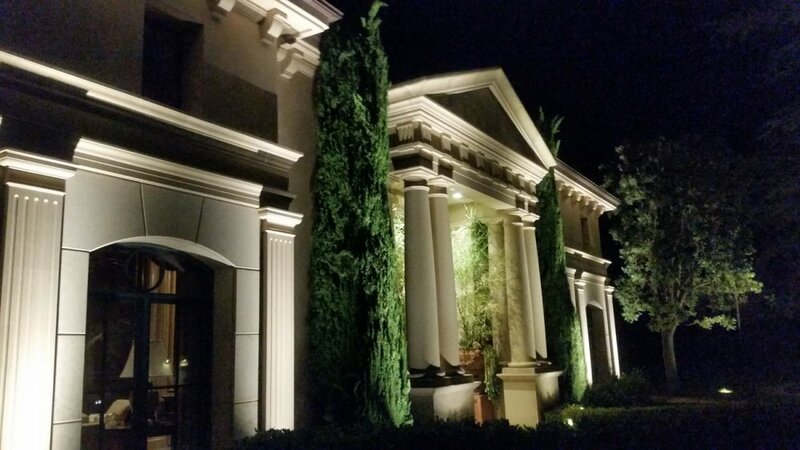 Photos of a project we finished using spot LED Architectural Lighting and Path Lighting in Coto De Caza California. 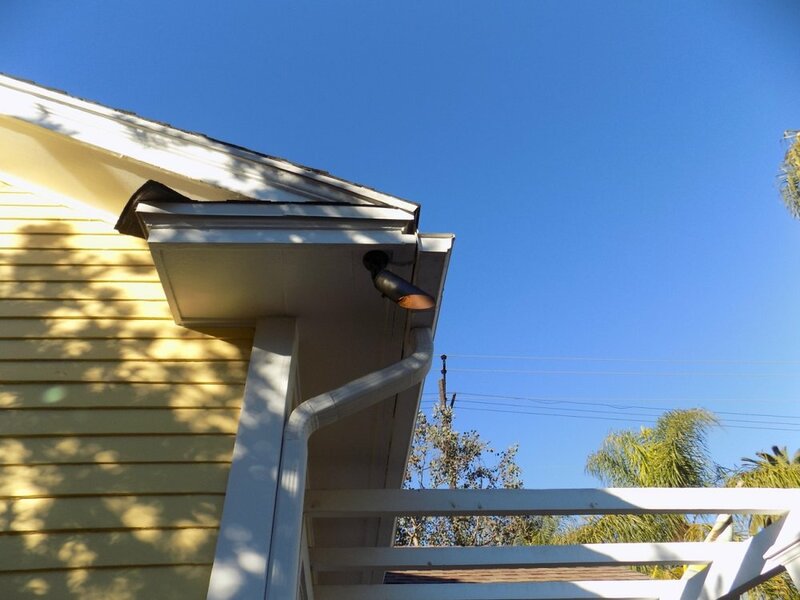 Installation completed by Orange County Night Lights Inc. Here are some shots of a few projects we completed. Many of these projects called for Architectural Lighting. We had alot of fun doing these projects. We take pride in what we do, We are always excited to see the final outcome, and what we can bring to your beautiful property with a well planned lighting system. Above, we are using all the current outdoor rated LED products. If you would like to schedule a free night consultation, please contact us @ (714)875-3591. Here are a few photos of a new installation in Long Beach, CA. On this project we utilized Spot Lights,Mini Spot Lights, Well Lights, Path Lights and also incorporated some moonlighting effects. All fixtures used are from our exclusive cast brass line. All Fixtures are LED which are consuming a total of 86 watts throughout the entire front of the property. We are happy to offer both digital and analog timers to suit your preference. Night photos will be added soon ! 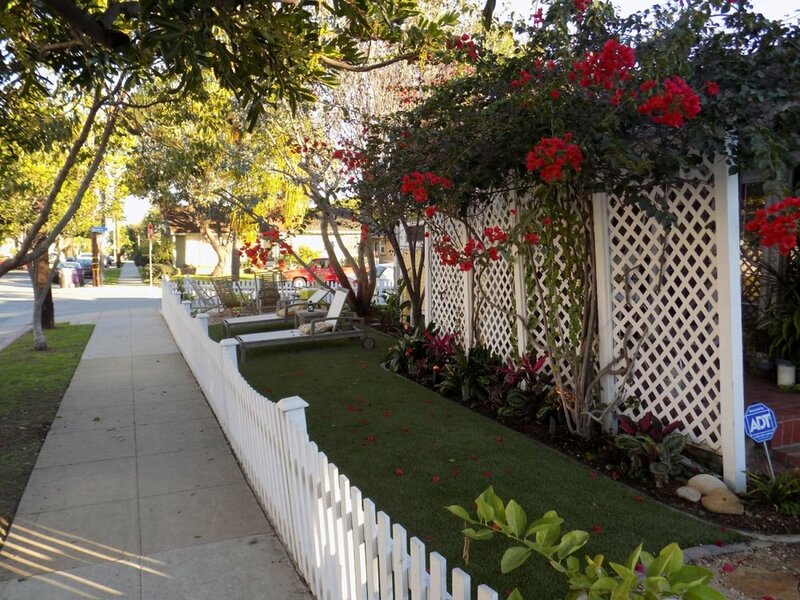 This project was completed in Fullerton California. We utilized 350 , 570 and 850 Lumen LED Up Lights as well as 180 Lumen Path Lighting throughout this gorgeous home. We were thankful to have the opportunity to use our creative methods to truly showcase this remarkable home. 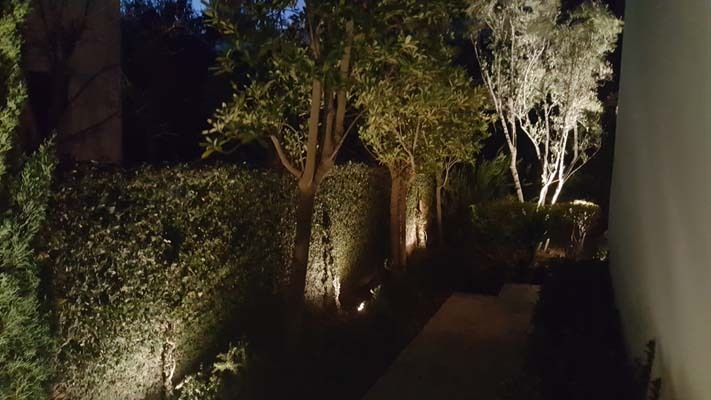 Here are photos of a recently completed LED Landscape Lighting project in Aliso Viejo. This client wanted to create a stunning emphasis on the structural elements of their home. 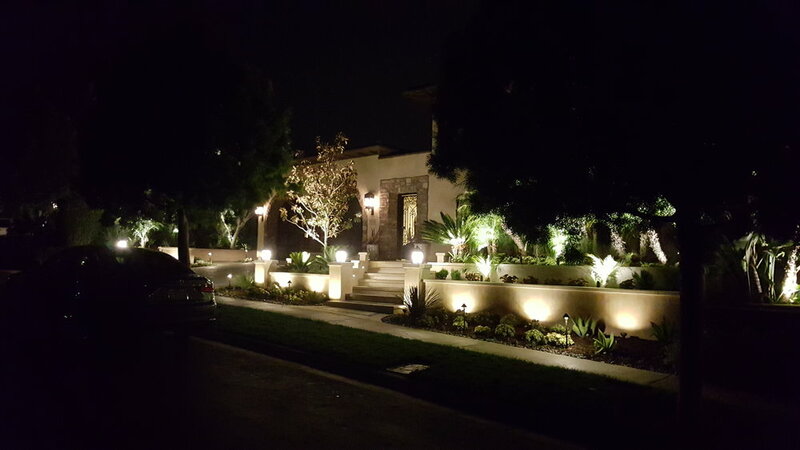 Led Outdoor Landscape Lighting in Newport Beach Ca. Design and installation completed by OC Night Lights Inc.